This is the third in a series of posts about the development of the visual elements of Donna Druchunas' new book: Ethnic Knitting Discovery: The Netherlands, Denmark, Norway, and The Andes. Today's topic is the schematic illustrations and the flat project drawings. A lot of technical editing needed to take place before these drawings could be done so they were correct. We didn't want just decoration or wishful thinking. Even though Ethnic Knitting Discovery is based on the idea that the reader will make a custom project in an individual choice of patterns and yarns, guided by the plans and worksheets provided, it would be pretty silly to put in drawings of items, especially sweaters, that look nice but won't work on the needles. The drawings show one possible interpretation of each design plan. However, it's a real interpretation. We couldn't, of course, knit every possibility, either! 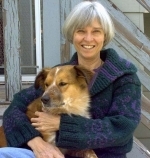 Debbie O'Neill knitted a Norwegian-style pullover and an Andean sweater, following the plans with her own interpretations. These are shown on the cover and Debbie's stories of her design decisions are included in the book. Kris Paige knitted at least one sample of the small skill-building projects that introduce each chapter—scarf, cap, headbands, and bag. I knitted two of the small Andean bags as well (mostly because I find them completely charming, they're quick to knit, and they're great fun). Kris made her Andean bag at a small gauge from handspun llama in natural colors! It's terrific. And she made three headbands. And I did a heap of "knitting" in both software and on paper to check the worksheets and the process instructions at a range of "normal" gauges, from 3 to 6.5 stitches to the inch (12 to 26 stitches / 10 cm). My demonstrations here will all be drawn from Project 3, The Netherlands, Sampler Pullover, pages 58 to 67. I completed these drawings myself. 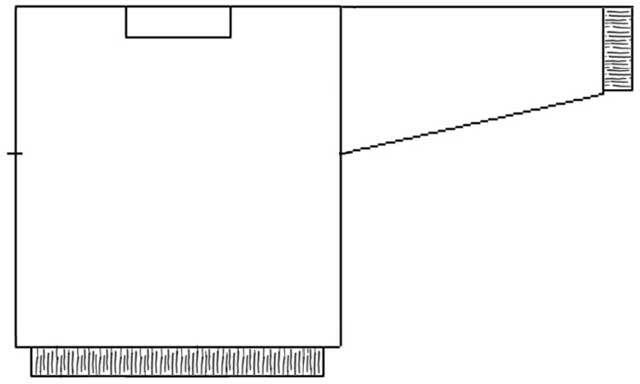 Schematics show the shape of the project or sweater in outline form. They're a fundamental knitting roadmap. 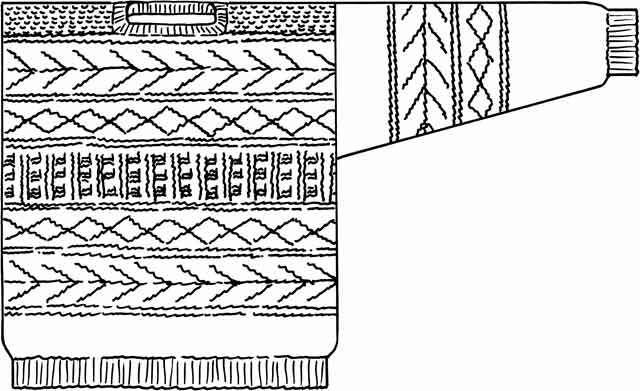 The schematics in Ethnic Knitting Discovery are drawn to scale at a standard size that is explained in the book's introductory material. Donna maligns her drawings in public, and it's true that she's not a trained artist, but having some visual reference is golden and she gives me plenty to work with. I scanned in her rough drawings of all sorts (there's another of her drawings later in this post) and used them for preliminary layout. That helped the project move along at a nice pace before we had "real" illustrations. The sketch above became page 62 in the finished book. I'm writing this away from home and didn't bring the PDFs of the book with me or I'd show you the comparison. There will be plenty of images in this post, though, so it's probably just as well that I can't. I needed to make sure that what we printed for this was (1) correct, (2) in proportion, and (3) clear. 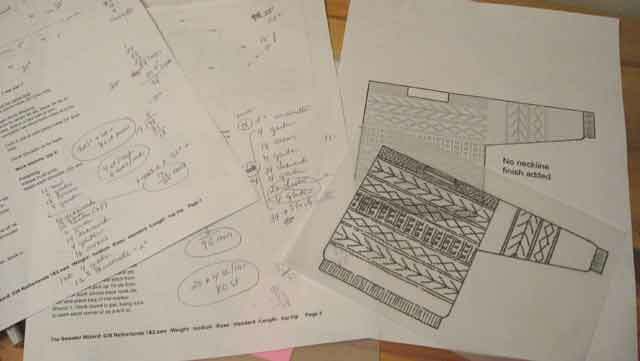 First I went to the associated project worksheets and, using Carole Wulster's Sweater Wizard software, I drafted a sweater pattern to fit the exact sample measurements we were using. I exported the resulting pattern pieces and combined them in a Photoshop file. To do this, I needed to tech edit the worksheets (the first tech editing: the worksheets got three or four tech edits before they were done). Working in Photoshop, I removed the measurement indicators, rotated the sleeve, and set up the two sections to be combined. 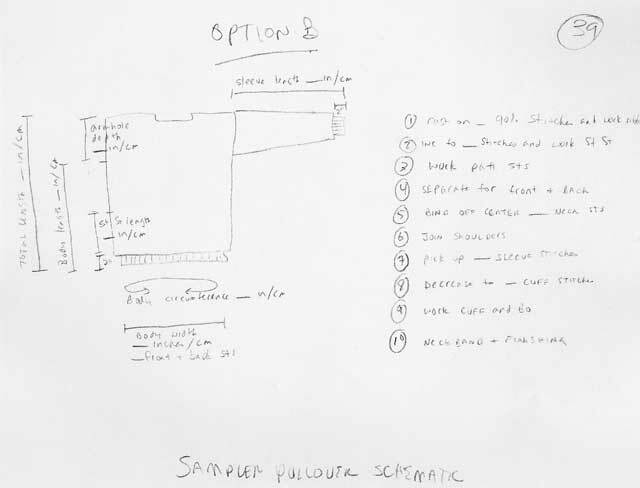 On this sweater, the sleeves are picked up and worked down from the shoulder, so I needed to move the sleeve to the left and join it to the body for the schematic. For sleeves worked from cuff to shoulder, I would have left space as in the preliminary set-up above. Here's the finished computer reference version of the schematic. The ribbing indicators were a hand-drawn texture, scanned in and electronically duplicated to fit the lower edge and the cuffs. We ended up not using that texture on the final schematics. We did use a variant (hand-drawn) on the flat drawings. Then I got out my pens to produce the final. I made these drawings last spring. I have since learned how to do this work in Illustrator, but I think I would still choose to use hand-drawn ink in a number of situations because I like the less mechanical feel. I may just be old-fashioned. 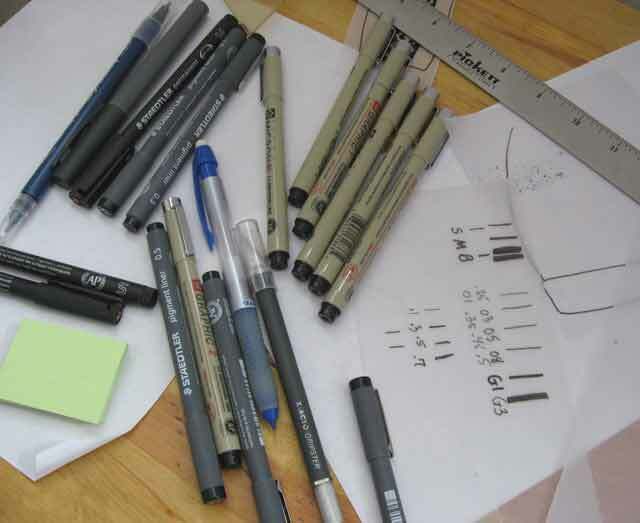 The paper shows different line weights produced by the variety of drawing pens. I used that scrap as a reference while I worked. Fortunately, this is work that can be done with music in the background. Editing can't be. So drawing offers a nice change of pace, although I need to be very deliberate about it. I can't work on drawings when I get tired, and each drawing needs to be inked to a certain level and then the ink needs to dry before I can do the next section. While I worked on later sections, I used scrap paper to cover already-inked areas so the moisture from my hands wouldn't smear the parts that were done while I was working on the next sections. One advantage of working with scans of hand-drawn images is that we can clean up slight slips of the pen and other irregularities after we've turned them into electronic files. Someone who wants precision, or more than accuracy, would definitely be working in Illustrator on this job. I figure knitting is flexible, and the slight variations in the drawings are compatible with that quality. 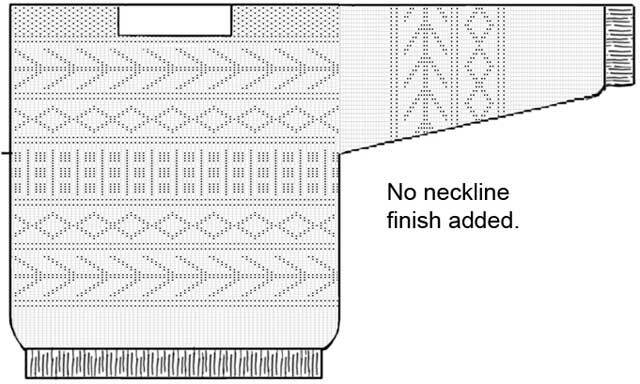 The flat project drawings are intended to show the knitting as it would look with all its finishing touches in place: a possible arrangement of patterns, neckline finish, and other details. As I mentioned earlier, the projects in Ethnic Knitting Discovery can be knitted in many gauges and sizes. 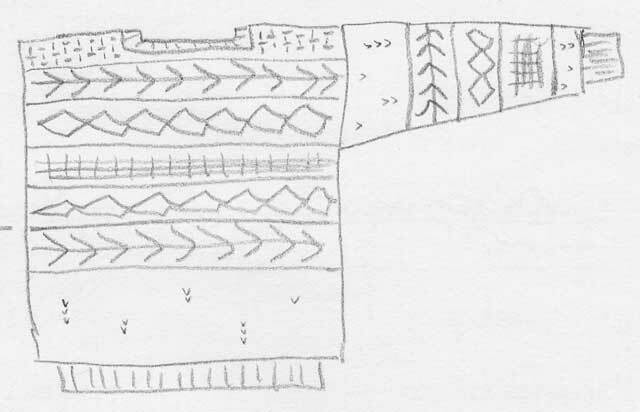 This sample sweater was planned for a 40-inch (102 cm) body circumference and a gauge of 4 stitches and 6 rows to the inch (16 stitches and 24 rows / 10 cm). Donna knew, and successfully showed, what she wanted a sweater to look like. She wasn't thinking of a specific gauge or size—although she has enough experience to have darn good instincts about what will fit. Check out the numbers of repeats for a couple of the patterns, comparing her quick sketch with the final drawings, if you'd like confirmation of that. Basing my stitch and row counts on the calculations generated by Sweater Wizard while I was constructing the schematic, I turned to Knit Visualizer and began putting together a very specific design—one that could be knitted. Each of Donna's chapters has a selection of diverse and compatible stitch patterns and I had swatches and charts to refer to (described in yesterday's post). 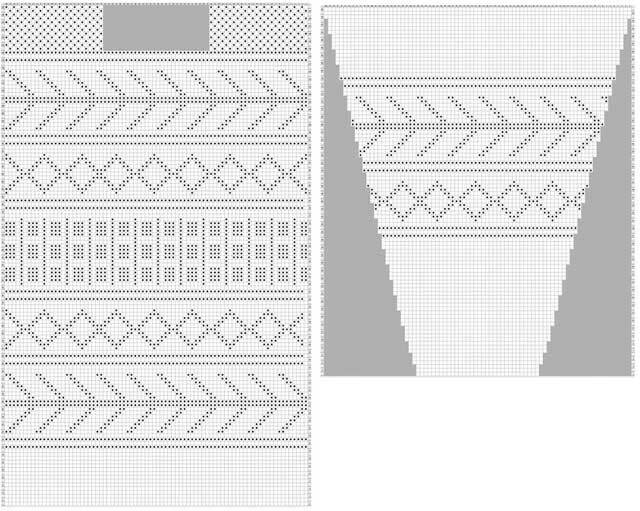 Here's Knit Visualizer's version of a possible sweater at the sample size and gauge. 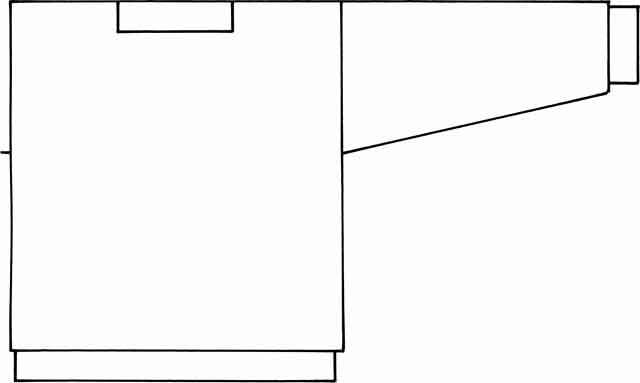 Note that the stitches are square, so the results are elongated. The row and stitch counts do work with the calculations. Here's where things got both tricky and fun. 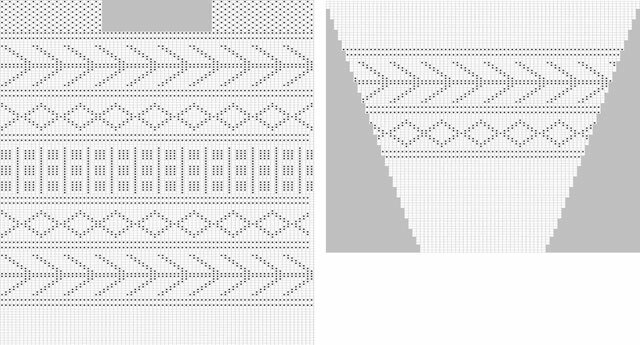 I exported the Knit Vizualiser patterns into Photoshop and resized them (1) to stitch/row proportions to match the gauge swatch and then (2) to the same dimensions as the schematic. The second resizing served as a crosscheck that I'd gotten the math right in all the previous steps. If I had, I could put the patterning in a layer over the schematic (combining the shape and the pattern in one Photoshop file) and they'd fit together just about perfectly. This almost always worked the first time! I noted that there was no neckline finish yet. The opening of the neckline is to scale, but there's no ribbing yet. I did that manually when I completed the drawing with my pens. Here are some of the worksheets for the pattern on this sweater, the reference drawing above, and the finished ink drawing. I worked over the reference drawing, using permanent ink and artist's vellum, which is a very smooth, translucent paper. You can see by comparing the electronic version, above, with the finished version, below, that I didn't trace. The point was to produce a drawing that reflected the impression the stitches would make when knitted, not to reproduce a graph. I kept the swatches nearby as I worked on each pattern stitch area, and used the charted version to guide my placement of the patterns and their repeats. 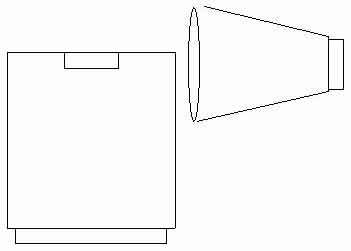 The drawings needed to be simple in order to represent the finished effect. The schematics and the drawings were produced at about 130% of the intended finished reproduction size. This helps make it easier to reproduce images; working larger-than-final has been a standard illustration practice since the old days of photostats (cameras that were used to make reproducible art that consisted only of solid black or solid white areas). It works at least as well now in the digital age! The number of repeats in all directions works for a sweater knitted at the sample gauge and size. 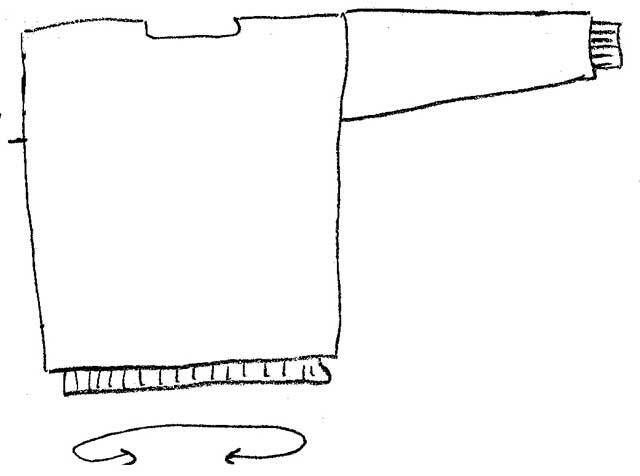 In addition to serving a specific purpose in the printed book, these drawings also provided solid reference information for the later drawings of the sweaters on people and the smaller projects being either worn or, in the case of the bag, showcased on their own. I went through the process noted above for each of the twelve projects in the book. I redrew most of the drawings in ink at least once. After I'd completed almost one full set of drawings, I decided that the line weights were wrong, so I changed my combination of pens and started over. It's possible that the drawings are still slightly heavier than I'd think was ideal, but they're (1) correct, (2) in proportion, and (3) clear, as well as (4) better than the first set, and the deadline was looming so they had to be declared DONE. Supplementary post on why Nomad Press books use black-and-white illustrations instead of color photographs. Hmm. Why is my name on the cover of this book? It seems like I did the least amount of work of everyone involved! Thanks to all of the illustrators and especially to Deb and Bekah for all of their help in turning my text and pencil sketches into a magnificiently beautiful finished book. I love how you combine electronic and hand drawing. I do most of my work in Illustrator and Photoshop and I think it loses some of the visual interest. The drawings look pretty flat and dry. Yours have such a lively feel. Thanks again for the behind the scenes look. Wow, impressive marriage of technical and manual drawings! I'm delighted to hear that you folks like the resulting drawings. And Donna, you give me and Bekah great stuff to play with. It always takes longer, though, than we think it will! I'm sure you've noticed that. . . . I try to "estimate long," and then something always comes up. As long as we make the final, final deadlines, it works out. Wow - that is a really really neat usage of Knit Visualizer & other tools! I also really like how you combine the hand drawing with the computer output to create something better than either could by itself. Thanks for going into such detail on this, it's really fascinating to read.